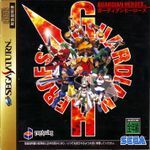 Guardian Heroes is an arcade fantasy beat'em-up with some RPG elements, made by Treasure for the Sega Saturn. The player(s) take the role(s) of a group of heroes who have found a strange sword, and are suddenly attacked by the King's soldiers. As the game progresses, they are drawn into the secrets of the kingdom and take part in a battle between the forces of Earth and those of Heaven. The game plays like an advanced beat'em-up with special attacks similar to those of fighting games like Street Fighter II. The players must defeat all the attacking forces, all the while advancing. After most stages, there is a story sequence in which the player(s) can choose how to comment upon the situation, this choice effectively being a choice for the next stage, and the game features several endings depending on what route the player(s) take. The game plays like a 2D beat'em-up, with the players able to move "into the screen" on three "layers of depth", effectively creating three parallel 2D layers that the players and foes could jump inbetween. Characters on different layers can't hit each other, but some area spells span over the layers. Apart from the arcade game, the game features a "VS mode" in which six players (with a multitap) can battle on an arena. In this mode, players can use any character they have encountered in the arcade game, even the final bosses. The revived sword of legend will once more bring light to a world tainted with darkness. Choose between the story mode made up by a multi scenario, or the versus mode where six players can play all characters in the game. Rich options and full of variation!